With each new communication channel, consumer behavior shifts. Once cellphones and desktop PCs being the primary communication channels in the past, consumers now live with their smartphones on wherever they are in. Consumers are 7/24 online, connected with their social network and have access to information more than ever, thanks to the smartphone technologies. Considering market research is getting conducted to understand consumers and build better products/services for the sake of business growth, studies should be done in the most organic channel to connect with consumers. First, market research has started with pen-and-paper surveys; since it was the easiest and the most organic way to connect with consumers. After that, CATI (telephone research) came in. Then, we have met with online research — where research firms were pushing new research surveys to consumers via their online channels, and notifying consumers via e-mail on new projects. However, these options are not as viable as they were in the past. Consumers are facing a significant noise of information every day. Therefore, they are ignoring many communication channels if the context is not relevant to them. Phone calls from unknown numbers are not getting responded as they had been in the past, and consumers do not like interruptions. Pen-and-paper surveys are dead; consumers do not like standing at the exit of a supermarket with their shopping bags. These are the changes in the consumer world. Consumers want relevancy with everything they are interacting with, and they want to engage when they want to engage — not the other way. In the business world, the need for market research is more complicated, and traditional methodologies have a harder time meeting these needs. There are several changes in the market which makes these old methods deprecated. Data accuracy is more critical than ever since the competition is more stringent. Therefore, 10%-30% validation of data is not enough. Importance of specific customer personas is increasing. Therefore, flexible and granular targeting is a vital need — but it is hard to access granular demographics and conduct studies on narrow audiences. Collecting data using professional auditors or pollsters pollutes data with biases of the middlemen. The need for organic answers is increasing. 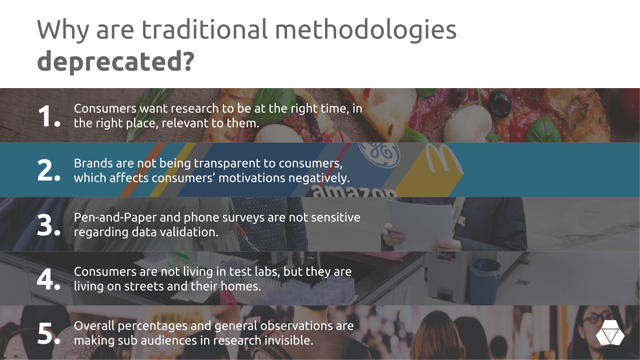 Asking consumers to come to test environments and making the research there is not representing the real experience. On the other hand, mobile market research fixes the issues businesses face on their research processes and provides a better research methodology for businesses to generate better insights. 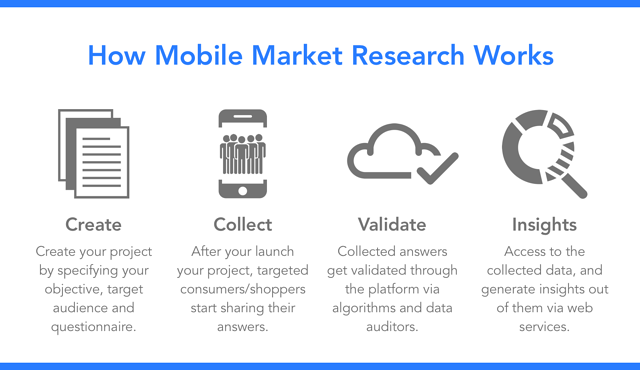 What is mobile market research? 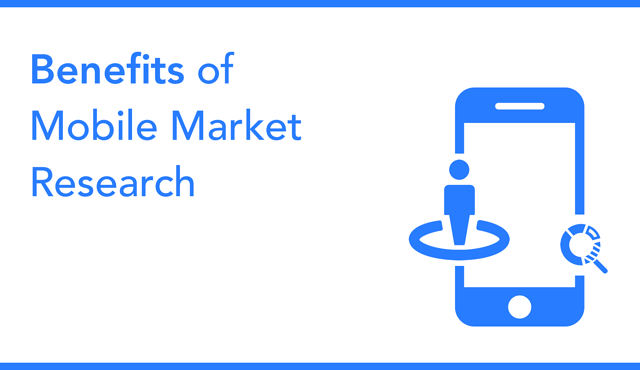 Mobile market research is a research methodology that connects businesses with consumers via smartphones. By connecting businesses with consumers directly, mobile market research allows businesses to collect insights from consumers and shoppers on their product usage, consumption behavior, shopping decisions, or in-store experience. Leveraging smartphone technologies, consumers/shoppers can be triggered according to their behavior, and answers can include rich multimedia (voice, pictures, videos), location and different types of answers. On mobile market research platforms, businesses open their projects, consumers/shoppers attend to the projects via their smartphones, answers get validated via algorithms and data reviews, and businesses can see approved data in real-time rather than waiting for a couple of weeks. Mobile market research allows companies to collect fast, validated, rich insights directly from consumers. Since mobile market research allows businesses to collect data from smartphones, brands gather answers from consumers/shoppers directly, without any middlemen. Mobile market research allows businesses to collect data within hours/days, rather than weeks/months. Via smart push notifications, businesses can collect insights immediately from consumers/shoppers. Consumers only see projects that are targeted to them, and collected data gets checked via auditing algorithms on platforms. After these audits, data gets reviewed by platforms so that all data collected is validated. Mobile market research allows businesses to get photos, videos and voice recordings from consumers — so that qualitative answers can be collected and businesses can generate additional insights. Answers can be collected from consumers according to their location or behavior, which allows businesses to gather in-the-moment insights and see/understand what consumers/shoppers see or experiment. Businesses can target consumers according to their demographics and behavior and can get granular information. Data you have collected and generated reports can be accessible 7/24 thanks to web technologies.